Hey Collabor-Artists here is my entry for Pat's DID CJ this month. I chose the song Someone Like You by Adele which I loved. I sprayed the background with Dylusions sprays first and then did some of the ghosting technique with a letter stencil. I stamped some background stamps with black Stazon and a Navy SU ink. The stamps were a Chinese character one, a Kaisercraft butterfly one, a VivaLasVegas one and the Unity Brave Girl set I thought fitted the theme of the song. I have been inspired by some of the previous entries to do some freehand drawing and have been doing heads and shoulders mostly. No faces yet as I'm not happy with them but it's coming. I used some Sharpie poster paint pens and Neocolor crayons to do the head. I actually think the lack of a face fits the theme of the song. 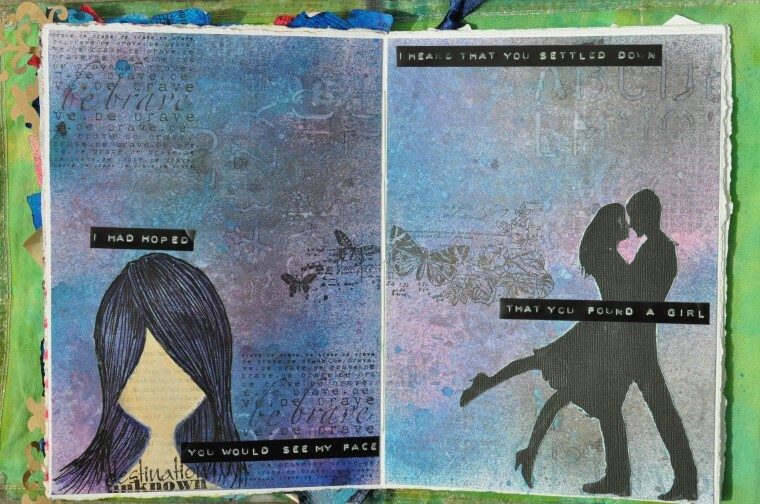 The couple on the other side are a Silhouette cut on the Coredinations cardstock which I distressed around the edges and then put some of the song lines on with my trusty Dymo. I have to admit to making no additions to the other entries this time as I couldn't see how I could add anything else to complement what was there. I wondered if it's because we are in the final stretches of the CJ. I was on a roll so I have finished Sian's CJ entry as well, I'm feeling pleased with myself. It's great seeing the CJs in the last stages and seeing what everyone has done. lovely entry, I especially like your head and shoulders on the left hand page. I like your background especially on this one, it almost looks like a Basic Grey paper, which is a big compliment as they were always my favourite papers :) And your 'faceless face' is lovely, love her hair! Wonderful background, the colours and stamping are so delicate. Your faceless face is great without any features!